This is a time-line of some events I have undertaken. The comments are my informal response and are not the official opinion of Dereham Town Council. This is the last Finance Committee before the election. I am very pleased to leave this Council session with the Town properly funded for its known commitments and having some flexibility as to how future projects and improvements will undertaken. The committee received a presentation from Friends of Dereham Memorial Hall, considered applications for grants, reviewed expenditure against budget, considered how to record new play areas and open spaces in the accounts, considered the capital building repairs for 2015/16, considered funding improvements to Neatherd pond, considered Neighbourhood Planning funding, looked at the legal consequences of the Smaller Authorities' Local Audit and Accountability Framework from April 2015, reviewed (and postponed any decision) on an update to standing orders, reviewed the Financial Regulations and finally reviewed teh Asset Register. Meeting at Signpost House, Ambassador Way this is the third meeting of the group. It is starting to find its feet and work out what is needed for Dereham. What do you think needs to be done to improve doing business in and around Dereham? What do you think the Dereham Business Forum should do? The substantial feedback from this brainstorming will feed forward to future meetings and could be a useful input to our Neighbourhood Plan. As part of this evenings meeting the chairman of the Dereham Society, Philip Morton, asked if I would explain exactly what a Neighbourhood Plan (NP) is and how people could get involved. I started by describing the Local Development Framework (LDF), which was supposed to run until 2026, but had been abandoned as part of the 2011 Localism Act. The Town Council had fully engaged with the LDF and the agreed 2000 houses and 1800 jobs that would be created. The problem will abandoning the LDF part way through is that while most of the houses were built (or at least agreed) the jobs were still to come and so now wont happen! As described elsewhere in this blog, there is a significant additional threat as a consequence of 2011 localism act, namely that if there is not a 5-year housing supply throughout the Breckland District, any 'sustainable' development must be looked upon favourably by planners. This has been taken to mean permission granted in Dereham, even if the shortfall of houses is in Thetford. I am still feeling my way through the NP, but I suppose the best way to sum it up is consultation, consultation and more consultation. 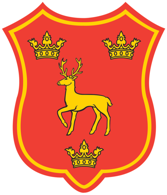 Very briefly: after the consultation has created a set of policies it is externally examined and if found coherent then it is put to a referendum of the whole town. If a majority agree the NP is adopted and becomes a strong development plan. It is not possible to have a policy of 'no houses' because this is not coherent, but we can describe what type, where to build, who they are for, etc. The NP can also develop policies on employment and infrastructure and how the town is accessed, be that by vehicle, bike or foot. There followed a discussion and consensus that the Dereham Society would contribute to the NP. While the existing officers of the society would like to hand over to other (possibly younger) members, it was recognised this could take a little time and they were willing to continue while this worked through. Dereham SNAP meetings are open to all residents of Dereham and the surrounding area. They are a method by which the public has an opportunity to raise any issues or concerns as police, partner agencies and residents meet up to talk about what has been happening in the area and decide what the priorities for action should be over the next few weeks. Usually plans is followed by committees, however in consultation with the chairman of Markets & Buildings and chairman of Social & Welfare these were postponed so that we could discuss setting the boundary of the neighbourhood plan. The committee defined a series of ever decreasing inclusion areas which may be appropriate to include in Dereham's neighbourhood plan. The options will be sent to Scarning Parish Council tfor consideration. Of course Scarning may wish to do their own neighbourhood plan and might not want any of their parish to be included, but the core tenant of neighbourhood planning is consultation and that starts with defining the plan boundary. Some of this worked extremely well, but there are always lessons for next time. The steering group met for a final time to analyse the process. Overall the project was successful, with good feedback from participants and a very positive feel. However, the framework was too often too bureaucratic and rigid especially with an overly complex application form. Despite this rigid format it was not clear exactly how the steering group could influence the process in the best interest of achieving wider participation. The text voting experiment worked well and helped engage more people. No one knew ahead of time how this would work so it was hard to cheat, but we must consider how easily results could be manipulated if this method is repeated. I PDF copy of the feedback report is available. Following on from the success of GoGoGorillas! in the summer of 2013 GoGoDragons! 2015 is an interactive arts sculpture trail bringing over 80 large painted sculptures and over 100 baby school dragons to the streets of Norwich. 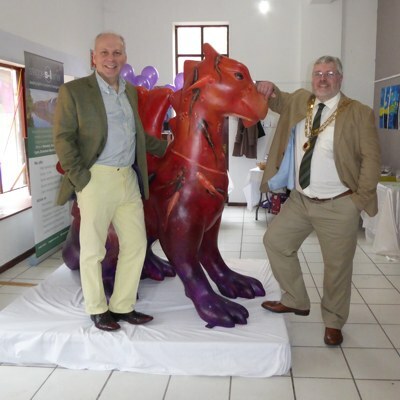 One of those dragons has been sponsored by Steggles-Larner and is painted by Art Academy East in Aldiss Court. My congratulations to the artists for the high quality of their GoGo Dragon. This is not my area of expertise but when you look a second or third time and see something new and then start to read a story into the imagery it must be good art. The artists tell me there is a strong link between koi fish and dragons in legend, which is why they chose this theme. The whole show benefits a number of charities in our area including Break. Opposite I am standing with James Steggles, managing director of Steggles-Larner, it may look as if I am tickling its nose, but really I'm being being careful not to annoy the dragon! Today is the day when the public decide which projects to fund. There are more projects than money available so the selection process is real. Held at Queen's Hall, Watton. The venue wasn't quite big enough so extra tents were installed alongside; while I appreciate the need to share events around the district I wonder if this might not have been better placed at Dereham Memorial Hall, which would have been large enough as-is. ■ Breckland Lodge Hotel, Attleborough. ■ Watton Thursday Club, Watton. ■ ESCAPE Community Garden and Friends of Swaffham Orchard, Swaffham. ■ Arthur and Ann Clarke, Litcham. ■ Eleanor Doyle, East Harling. ■ Judy Leary, Swanton Morley. ■ Attleborough Academy Norfolk, Attleborough. ■ Eco Bugs, Wayland Academy, Watton. ■ Mattishall Primary School, Mattishall. ■ Maria and Riley Cork, Beetley. ■ PC Paula Gilluley, PC Matthew Woodgate, PC George Healey, PC Jeremy Blamire, PC Christopher Curtis. 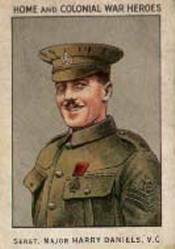 ■ George Northall, Swanton Morley. were chosen in nine categories from over 90 nominations. The format was as typical awards ceremony with invited presenters announcing the winner in each category. Congratulation to all who were nominated, there is some inspirationally good work throughout Breckland. I was in two minds as to whether to do this, but on ballance I felt it better to take part and stipulate that Dereham must not be misrepresented. I was interviewed (in Memorial Hall coffee shop) about the murder of Elaine Walpole in 2008. I recall the incident and how shocked the town was, because basically this doesn't happen here. At the time the family asked for privacy but now FlameTV has agreed to documant the event. After the interview I was asked to sign an agreement that FlameTV can use my contribution. No problem, but they seemed to have a rather overinflated view on their place ... the agreement reserves all rights throught the "universe"! Aparently worldwide rights are no longer enough; I made a suitable remark on the document. The Town Clerk and I attended the Scarning Parish Council meeting to make a short presentation about our intention to develop a neighbourhood plan. The Town Council wish consultation to establish which parts of Scarning (if any) would like to be included in our plan. It makes sense to at least consider the area around the Drayton Hall lane estate as District Planners always include this with Dereham when considering wider plans as it is adjacent the town and some distance from the traditional village centre. Shirley Matthews is serving as Town Mayor of Swaffham for a further year, she must be one of the most frequently elected Mayor's in the district. It has often been said that Shirley Matthews has a 'season ticket' to most events. This is no small commitment as you can probably tell from this blog. Shirley's reception was at the George Hotel, or rather a large suite behind the older building. She gave an entertaining speech because her printer had confused all the page numbers in her notes although she was not phased by the problem. For more information about Harry Daniels, see his wikipedia entry . 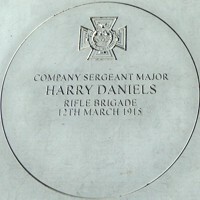 The event today was to unveil a new commemorative stone at Wymondham's war memorial in memory of Harry Daniels. 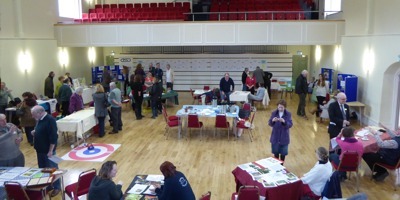 The event was well attended, with representation from across the County. The actual unveiling was performed by Norfolk's Lord Lieutenant Richard Jewson, (the lord lieutenant is the Queen's representative). There followed a reception at the Wymondham & District Ex Service's Social Club . This building is a superb re-purposing of an old cinema. I had no idea that as Mayor I automatically became president of the Rüthen twinning association and therefore was responsible for chairing their AGM. I pleased to have met a friendly group and one member in particular had discovered my micro-biography in which I describe living at Weeze in Germany. It turns out he also lived there at a similar time, what a small world. There was an element of clustering with our plans today. Two were for small extensions near each other in Toftwood, two were for signage all of the which Councillors were all content with. However, two further garden homes again very close to each other were considered less favourably because of the effect on neighbours. Report to follow after Tuesday's meeting. Commonwealth Day is the annual celebration of the Commonwealth of Nations. The Queen as Head of the Commonwealth, with the Commonwealth Secretary-General and Commonwealth High Commissioners in London mark the day by attending a multi-faith service in Westminster Abbey. 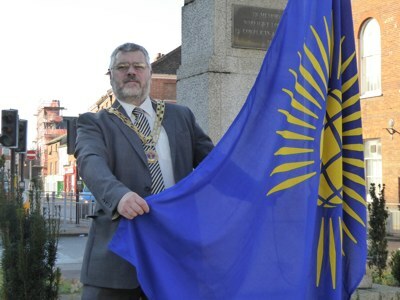 The Town Council has been provided with a commonwealth flag for us to fly along side the union flag on our two flag poles. Background: The 'Commonwealth of Nations' was formally constituted by the London Declaration in 1949. It is an intergovernmental organisation of 53 "free and equal" member states that were mostly territories of the former British Empire. Dereham Town Pastors are Christian volunteers from local churches who will be out in Dereham town centre most Friday and Saturday nights. At the contact point there is no overt religious or faith engagement which is an important consideration to ensure inclusion. The Five churches involved are Dereham Baptist Church, Wellspring Family Centre, St Nicholas Church, Trinity Methodist Church and Eckling Grange Church; all have committed to support and care for young adults in the Dereham community. I have seen how effective the previous 'Street Pastors' have been at connecting with people who are not engaged with normal society. It is very difficult for the establishment (Police, Councils, etc.) to connect young adults who have become involved with drugs or petty crime, but the regular presence of Town Pastors can provide that connection and help. Clearly, the Town Pastors need the agreement of the Police, Town Council and District Council in order to work at minimum risk. It is possible for example that drugs of weapons could be handed over and the Town Pastors should not be prosecuted for 'possession'. 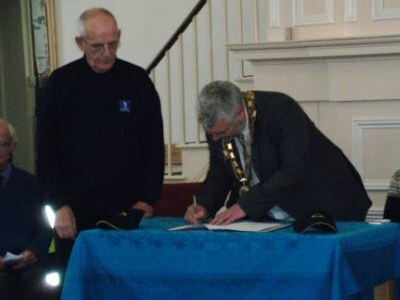 I was joined by the Police for the document signing, but unfortunately I understand that Breckland Council has not yet approved the signing, but have instead offered a letter of support. More than 175 people met at Toftwood Social Centre to express views on the recent LanPro consultation for 300 new homes.